Last night in Paris the 36th 2011 Cesar Film Awards was hosted by Jodie Foster. The actress looked stunning wearing a gorgeous silver gown teamed with Cartier jewels. 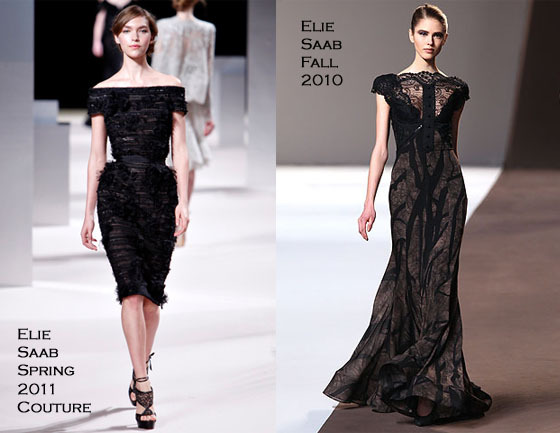 Kristin Scott Thomas was nominated for Best Actress wore an Elie Saab Spring 2011 Couture short black dress. Her gorgeous dress was embroidered with flowers and organza bands to which she added and Elie Saab black fox-fur bolero and black python clutch. Elie Saab completed a hat-trick of dresses on the red carpet with Emmanuelle Beart wearing a gown from his Fall 2010 collection. The French actress who was presenting on the night wore a printed crèpe de chine black and beige gown with buttoned and sequined lace and grosgrain top. She added a fur coat and an Elie Saab black clutch.